Arnold Electrical installed a 3.92kWp solar PV array For Mrs S in October. 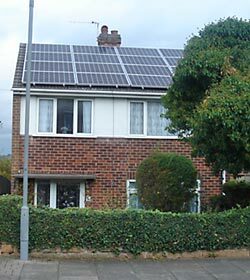 Mrs S immediately started receiving the government Feed In Tariff (FIT) at a rate of 43.3p/kWh for the electricity she was generating and an additional 3p/kWh for the export tariff, deemed 50% of the amount of electricity generated. She also benefits by using the electricity she is produced, therefore, reducing her energy bills and doing her bit for the environment. The payback calculation for this system gives an approximate generation income of £1,449.68, an export tariff of £50.22 and an approximate £234.36 savings from energy used. This gives a total income and savings for the first year of £1,734.26. As like all the other installations she will receive guaranteed payments from the Government FIT scheme for 25 years, plus these rates will be adjusted with inflation using the Retail price index. Taking into consideration inflation she is likely to receive an approximate income of £53,794 over the next 25 years, tax free. The system gives Mrs S an approximate 6 year pay back time and around 15% return on her investment, a great investment! This installation took 2 days to complete from start to finish, Mrs S was provided with all the appropriate paperwork during these 2 days and was able to send of her FIT application straight away and start enjoying the benefits.